David Warsen has refurbished hundreds of machines at Steelcase’s Kentwood, Mich., plant, from 50-year-old presses to new laser cutting equipment. When a press stopped operating recently, the 39-year veteran at the office furniture maker, a principal electrician, diagnosed and fixed the problem in minutes. So his boss was relieved when Warsen, who turns 65 in February, decided to take advantage of the company’s phased retirement program rather than simply end his career. Instead of the six-day-a-week schedule he used to work, including many Saturdays when production lines are down and equipment is repaired, Warsen puts in 30 hours over four weekdays. With 10,000 baby boomers turning 65 each day, businesses are scrambling to find ways to slow an exodus of the most experienced employees and ensure that they pass along their knowledge before they leave. Companies from Steelcase to First Horizon National in Memphis and Bon Secours Virginia Health System in Richmond are offering older workers part-time jobs and flexible schedules to ease them into retirement. Fourteen percent of U.S. companies offered either a formal or informal phased retirement program this year, up from 10 percent in 2012, according to the Society for Human Resource Management. 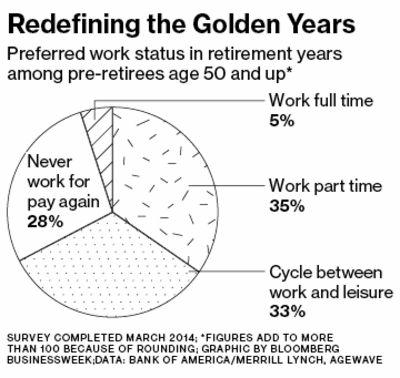 Phased retirement means different things at different companies. At Bon Secours, full-time employees of retirement age can switch to schedules of 16 to 24 hours a week. At First Horizon, employees within three years of retirement can reduce their schedules to 20 to 30 hours weekly if their duties can be performed in that amount of time, they’re willing to mentor successors, and they commit to staying on for one to three years. “It makes sense to have a transition instead of a sudden departure, especially for leaders,” says John Daniel, executive vice president. A 35-year veteran on his staff is about to start working a reduced schedule while her successor is chosen and will stay on to offer guidance. “She’s got decades of knowledge about people and processes, and I don’t want that walking out the door, even though it will cost us a bit more to keep her and also hire her replacement,” Daniel says. Realizing that it soon would face a tsunami of retiring boomers, especially in its IT and manufacturing departments, Steelcase started offering phased retirement in 2012. Currently about 800 employees, 15 percent of its U.S. workforce, are eligible to retire based on age and years of service. So far, 47 have elected phased departures. Those interested must propose the jobs they want to do—for at least six months and no more than two years—and why they think the arrangement will benefit the company. One manager got approval to work just one day a week to complete a project while mentoring his successor. “We’re asking employees to make a business case about how they’ll handle this and why it’s good for both them and us,” says Laurent Bernard, vice president for global talent management. He and his boss initially disagreed about his schedule. He’d wanted to leave early on Thursdays and take Fridays off, but “that didn’t fit with our workflow,” says Kempker. The two finally agreed Warsen wouldn’t work Mondays and would have three-day weekends, but would be at the plant on the busiest days. The bottom line: About 14 percent of U.S. companies let workers ease out of jobs with formal or informal phased retirement plans.